Experience the world's first revolving cable car, Titlis Rotair, in Switzerland. The 30-minute scenic ride up Mt. Titlis will give you the best views of the Alpine landscape. Switzerland might be a small country that is roughly two-thirds the size of Tasmania, but this country is an overachiever when it comes to breaking world records. You’ve read about the scenic train routes, the picturesque cycling routes and skiing in the shadow of the Matterhorn but the Swiss also have 12 world-record breaking attractions you’ll want to add to your travel itinerary. Switzerland is home to the world’s steepest cogwheel railway and can be found in Lake Lucerne. The cogwheel railway is one of the most popular attractions on Lake Lucerne thanks to its 48-degree gradient. Ascending 1635 metres from Alpnachstad (where the ferry stops), the railway travels 4618 metres up to the fun park of Mt Pilatus. The ride itself takes about 30 minutes and operates between May and November. The Charles Kuonen Bridge is the world’s longest suspension bridge and connects a hiking trail between Grachen and Zermatt. There’s nothing like crossing a suspension bridge to get your heart rate up, and you’ll find the world’s longest in Switzerland. The Charles Kuonen Bridge connects a hiking trail between Grachen and Zermatt and stretches 494 metres in length. The views from the bridge are equally thrilling, being set against the world’s most recognisable mountain peak, the Matterhorn. The Gotthard Base Tunnel is 57-kilometre long; making it the longest in the world. The Gotthard Base Tunnel has a long and legendary history originating in the 13th century, but it’s the length of the tunnel that breaks the world record. It took 17 years to construct the 57-kilometre tunnel that runs through the mountain at a depth of up to 2300 metres. Not only is the Gotthard Base Tunnel an engineering feat, but it’s also powered by hydroelectricity. The world’s oldest covered wooden bridge dates back to the 14th century and can be found in Lucerne. The Chapel Bridge in Lucerne dates back to the 14th century and was part of the original fortifications of the city. Destroyed in a fire in 1993 , it was quickly restored back to its original form. The bridge is one of Lucerne’s most charming attractions and is decorated with pictorial panels that depict historical life in the country and city during the 17th century. The glacier chairlift of Mt. 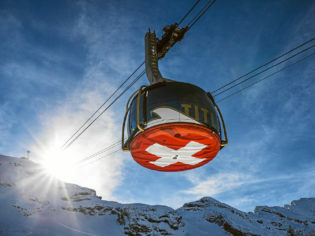 Titlis, the Ice Flyer, is the world’s first revolving chairlift. Not far from Lucerne is the 3062-metre-high Mt Titlis, home to Europe’s highest suspension bridge and the glacier chairlift ‘Ice Flyer’. To get up there you’ll need to take a 30-minute scenic ride on the Titlis Rotair – which is an experience in itself. As you travel above the spectacular alpine landscape, take note of the fact that you’re riding on the world’s first revolving cable car. The Swiss enjoy their own chocolate as even more than the rest of the world. They’ve given the world Nestle, Lindt and Toblerone, so it comes as no surprise that the Swiss are their own biggest fans when it comes to chocolate, taking home the record of consuming the highest amount of the sweet treat in the world. In 2017 alone, the average consumption hit 8.8 kilograms per person. That’s a lot of Lindt balls! The Michelin starred Ritzcoffier Burgenstock. Switzerland recorded a total of 128 Michelin starred restaurants in 2019, securing its position as the country with the highest number of top-rated restaurants per capita. Pavillon in Zurich and focus in Vitznau are the country’s most recent restaurants to make their way into the Michelin guide. The Lauberhorn-Wengen FIS Alpine Ski World Cup is the world’s longest downhill ski race. Attracting an average of 30,000 spectators each year, the history of the Lauberhorn-Wengen FIS Alpine Ski World Cup dates back to 1930 and takes place every year in mid-January. With the downhill course stretching over 4.4 kilometres, run times are usually 2.5 minutes where top speeds reach about 160 kilometres per hour. You can climb 11,674 steps to reach the peak of Nieson; making it the longest staircase in the world. Located in the Bernese Alps, the pyramid-shaped mountain peak of Niesen overlooks Lake Thun in Interlaken from 2362 metres above sea level. Ascending the peak can be done via a funicular, which departs every 30 minutes from 8am to 5pm, or by the impressive 11,674 steps. The Peak Walk at Glacier 3000 is the world’s first suspension footbridge linking two mountains peaks. Boasting spectacular views of more than 24 snow-capped peaks of at least 4000 metres above sea level including the Eiger, Monch, the Matterhorn, Jungfraujoch and even Mont Blanc, the Peak Walk at Glacier 3000 is the world’s first suspension footbridge linking two mountains peaks. Haus Hiltl in Zurich first opened its doors in 1898, and it holds the record for the oldest continuously opened vegetarian restaurant in the world. Having first opened its doors in 1898, Haus Hiltl in Zurich holds the record for the oldest continuously opened vegetarian restaurant in the world. You can take healthy indulgence to a whole new level at Hiltl, with its selection of 40 varieties of salad, fresh food juices and Indian buffet. Roger Federer, who was born Basel, is currently the world’s best tennis player. Planning a trip to the home of the Swiss? Make sure you check out the rest of our guide to travelling Switzerland.